The best compilations are very often the ones that succeed in contextualizing an experience—be it a genre, a movement, or in this case, a sub-genre within a decade. 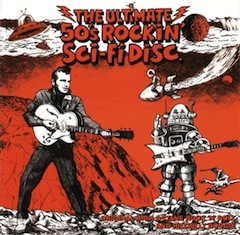 Taken as a whole the (fantastically titled) ’50s Rockin’ Sci-Fi compilation paints a picture of an alternate reality. Subtitled “Original High Octane Rock ‘n Roll And Hillybilly Boogie” the set gives us skewed glimpse of a decade preoccupied with the Cold War, bomb shelters, Eisenhower, teenage rebellion, the dawn of Rock & Roll….and, naturally, spacemen. Part of what makes this compilation work so well is the wholesale re-imagining of the decade over the past sixty years through the media; namely television and film. For those of us who were not there, the 1950s have time and again been delivered to us, and positioned, as a chaste era of bobby sox, poodle skirts, sepia naiveté, Elvis’s hips, James Dean, muscle cars, letter jackets and apple pie. In short, the calm before the storm that was “the Sixties.” Here we have a loose collection of songs from an atomic era when landing on the moon was science fiction, reports of flying saucers were en vogue and supposed beings from outer space had recently crashed outside Roswell, NM. Good times.